INGREDIENTS: Ikg White Farmhouse soap, 20ml White Tea Flower fragrance, Rectangle mould SB45, Classic French Country – Handmade Soap wrapping paper, Cellophane. METHOD: Gently melt your soap in the microwave or in a pot on the stove. Once the soap has melted add 20ml fragrance. Leave the soap to cool till if forms a skin on top then pour into the moulds right to the top. Leave your soaps about two hours to set and then un-mould them. They should stand for a day or two to dry out. 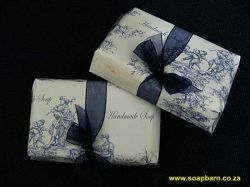 Then wrap your soaps first in cellophane and then in the Classic French Country Handmade Soap wrapping paper.